Thanksgiving marks the time of the year to give back, and this year there are a number of celebrities are doing just that in BIG ways. Here are a few of our favorites. 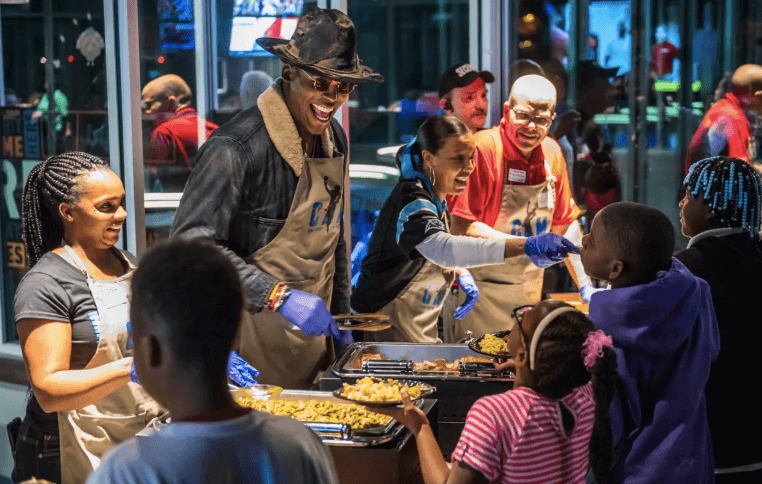 Cam Newton, quarterback for the Carolina Panthers, held his 7th Annual Thanksgiving Jam, serving up a delicious Thanksgiving feast for 1,200 underprivileged youth and even sending them home with an extra meal. The event served 400 more kids than in 2017. In honor of his album, 24K Magic, music artist Bruno Mars donated 24,000 meals to needy families in his home state of Hawaii. In California, celebrity chef José Andrés’ and his nonprofit World Central Kitchen plan to provide about 15,000 Thanksgiving meals to Camp fire survivors in the town of Paradise. Michael Jordan visited his hometown of Wilmington, NC to hand out Thanksgiving meals and donate sneakers to help with the continuing Hurricane Florence relief efforts. Former President Barack Obama helped to prepare Thanksgiving meals for local families at a Chicago food bank. We've got to give props to these celebrities who choose to give back.